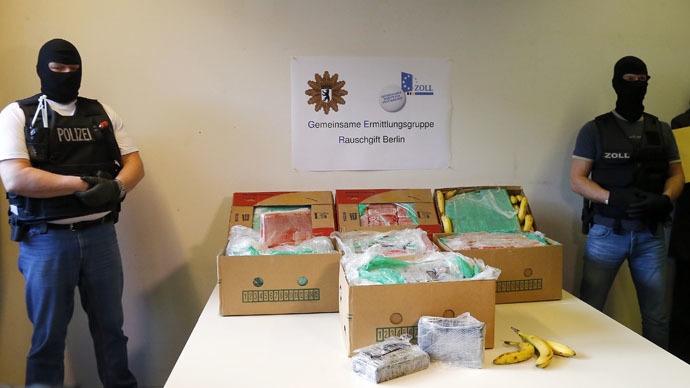 Drug smugglers have made a 15 million euro slip-up, as police found a record amount of cocaine in bananas delivered to 14 Aldi supermarkets in Berlin and Brandenburg. It’s not the first time the discount chain got more than it bargained for. Police spokesman Stefan Redlich said smugglers made a “logistical error” as the cargo was traveling from Colombia to Hamburg. "The route across the Atlantic is known by police. The wrong container was probably used when the merchandise was put on board ship. Or possibly, there wasn't time for the smugglers to unload it when it arrived in Hamburg," Redlich told AFP. The find weighed 386 kilograms (850 pounds), and only one box contained a kilo of cocaine, while others started from 10 kilograms and upward. Investigators are currently looking into other banana deliveries to Aldi supermarkets across the country. This is the largest drug haul to be discovered in Berlin in a single operation, with the second having been made in January 2014, when about 140 kilos of cocaine were found - also in Aldi supermarkets.